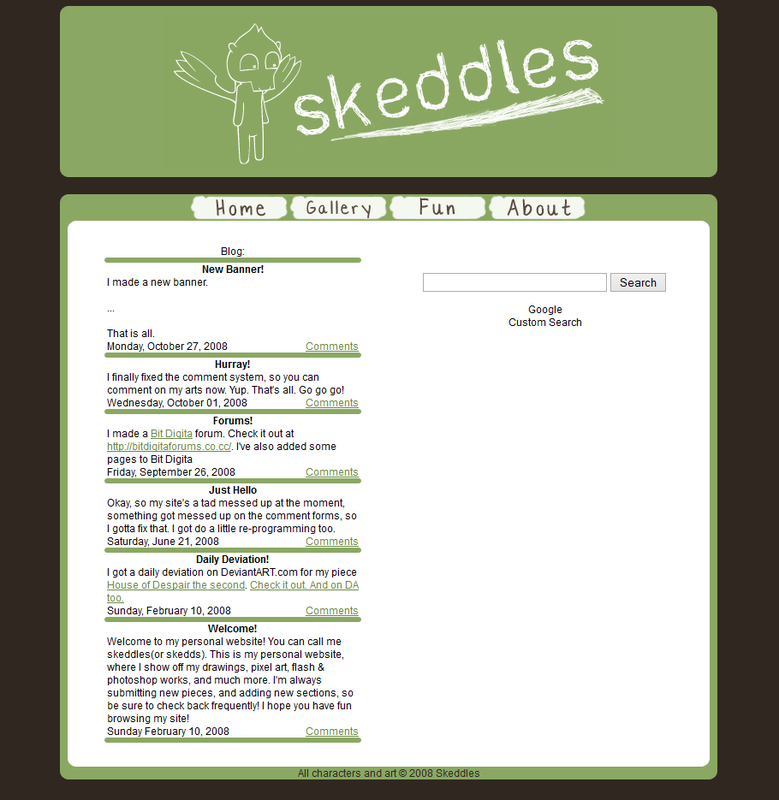 Here is where I finally got my own domain, skeddles.com. 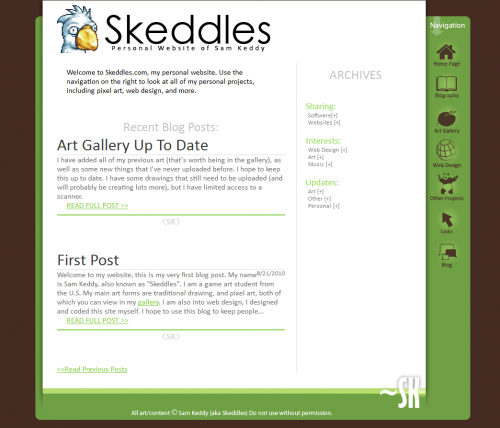 The design was a step forward, but the layout was coded with tables (all web developers just gagged a little). Green, white and brown were my colors for a while. At least this design was nice and simple. 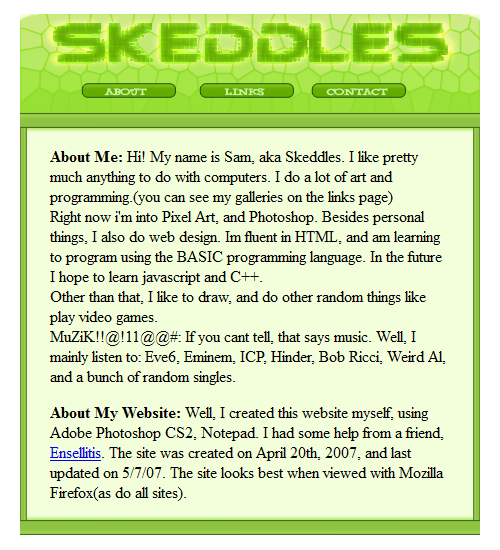 It hosted all my art and other projects, so it was good for the time. Actually, I think this one looks pretty cool. 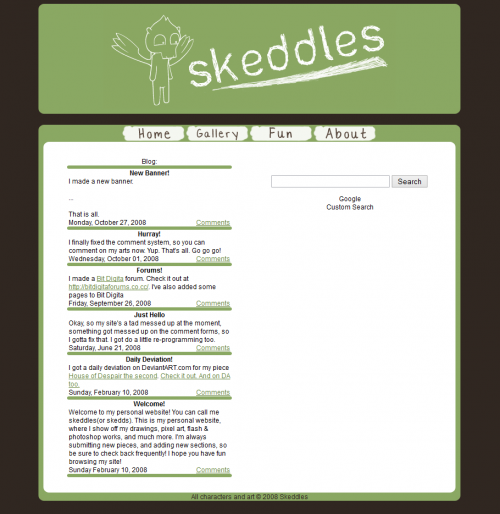 Like the way the sidebar meets the footer? That’s classy. And how can you beat a that “Other Projects” button? Also had the first version of my awkward bird avatar right in the banner. Don’t regret that at all. This was actually the closest to what I want now, just a place to put my stuff. 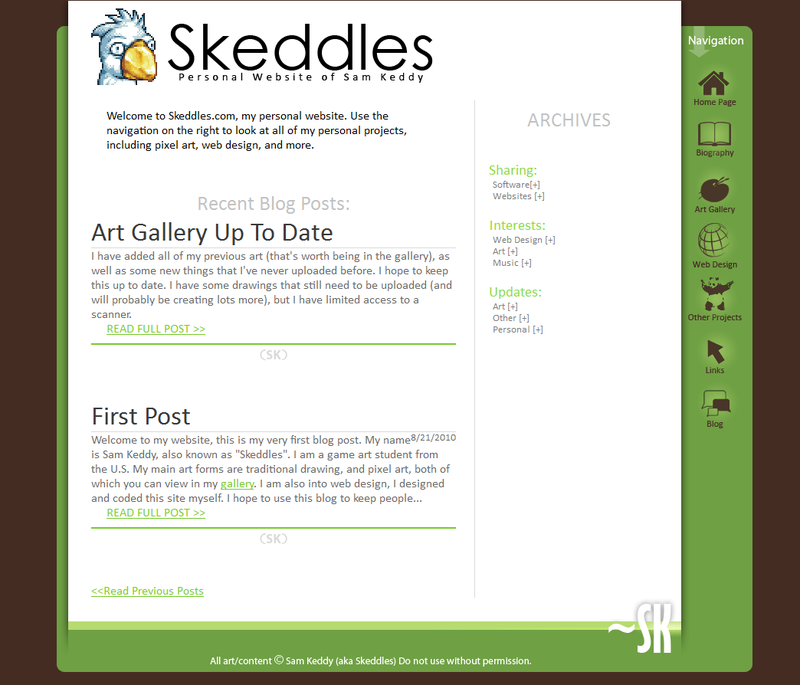 I think it must have been a wordpress site based on that sidebar, but I really don’t remember. 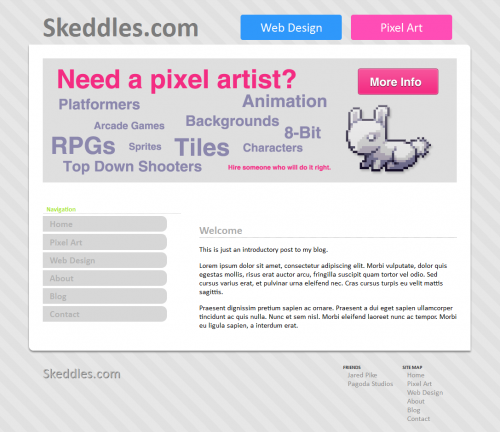 Here is where I decided I wanted to be a freelancer, doing some pixel art, and some web design. Pretty sweet banner, right? 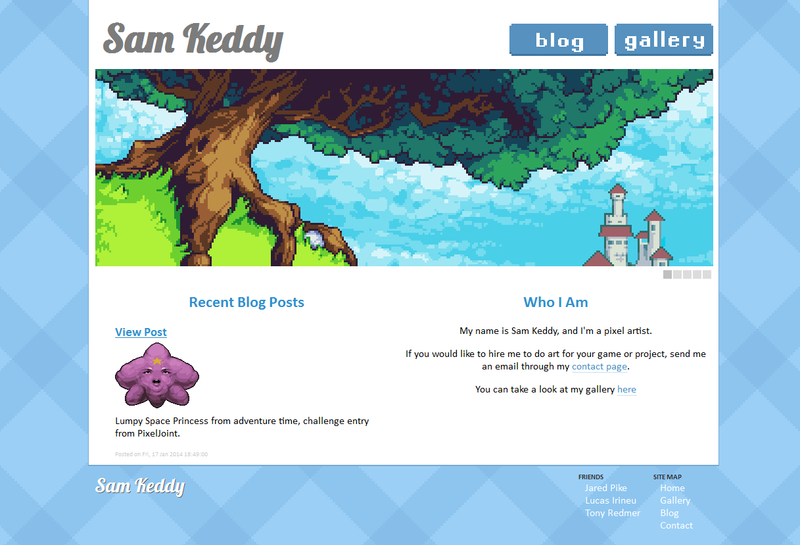 I started to clean up my act, trying to make it easier for people to get to the places I wanted them to go on my site. If you can’t tell where that was, I think you may be color blind. 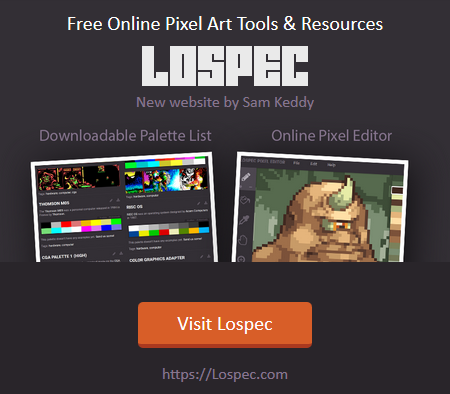 Here is where I wanted to try being a freelance pixel artist. I switched to samkeddy.com (so that people would take my cute little cartoons seriously), and tried to downsize the scope of my website. I gave it a simple pixelly feel, to really push the pixel art feel (IN CASE YOU DIDN’T SEE THAT GIANT SCROLLING BANNER). I had a semi-detached tumblr blog instead of using wordpress, because I figured if it was easier to write posts, I would post more (I should let you know that I’ve since learned that shortcuts may get you there faster, but when you get there you wont have learned anything). It worked for a bit. Tumblr is super easy to post with, and the reblogging feature is great for post visibility. But once I took a hiatus from using Tumblr, my blog also took a hiatus from being active. So this is the new layout. Flat, simple, professional. Hopefully easy to read and navigate, and works on computers, tablets and phones. I tried to make it as easy to comment on posts as possible (a blog without a comment section is like a store without a sign – super sketchy). It also more accurately shows off what I’m capable of website design wise. 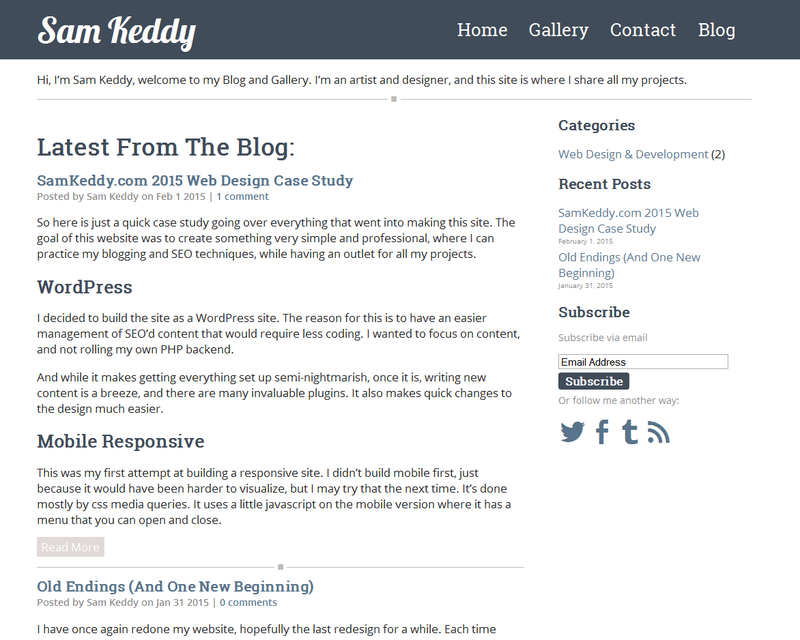 Once again, I am starting a wordpress blog. The reason I want to do this is I feel it will be great SEO practice, and it will give me a place to share all the random things I take part in. I’m going to be a bit looser with this blog, all my previous ones were a bit too targeted, which was too much pressure. So I should be posting a good variety of things here. I’ll keep you updated with projects I’m working on, write tutorials for art/programming/whatever I’m into at the time, maybe feature some artists or games that I enjoy. We’ll see. If you are interested in the more technical side of this new design, check out my post SamKeddy.com 2015 Web Design Case Study. Since I’m pretty sure these days people only visit social media websites and the pages they link to, I will have my posts sent out through Twitter, Tumblr, and Google+. Just kidding, not Google+, Facebook. Even though Facebook makes you pay for views now (THANKS ZUCKERBERG!). So if you want to stay updated, follow me on one of those sites. You can also subscribe by “email“, if you know what that is. So that’s about it, I’ll post as often as I can, and please don’t be afraid to comment on any posts or hit me up on social media.